Life moves fast, and the older we get, the faster it seems to move. Time spent with work, family, children and the day-to-day responsibilities involved with simply living on this planet means that most of us look at the clock at some point during the day and say in disbelief, “Is it that time ALREADY?” In fact, American moms report having just 36 minutes of free time per day. So when it comes to making choices in healthcare, it’s no wonder patients opt for convenience. Finding healthcare that fits with busy schedules, yet affords patients the same conveniences they find in other areas of their life, has never been more important. In fact, in a recent 2016 study, researchers, responding to the ever-changing healthcare climate, set out to discover what is most important to consumers when it comes to their healthcare needs. The study focused on people from all walks of life: varied age groups, income and education levels, and ethnicities. In the list of the top three items most important to consumers was, you guessed it, convenience. In response to a world that moves fast, healthcare organizations are finding new and better ways to meet their patients’ needs, offer convenience, but still deliver value. 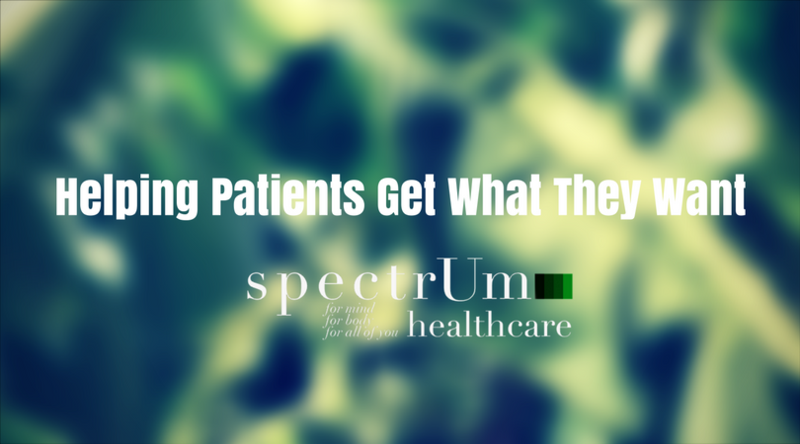 At Spectrum Healthcare, we understand this completely.